Inspired by the success of our BBC LS3/6, the Stirling Broadcast SB-88 is a two-way loudspeaker designed by Derek Hughes. It draws on his decades of experience in reference quality loudspeaker design which began with his work for the BBC in the 1970s. Derek’s design has retained the essential character of the LS3/6 by using the same low and high frequency custom drive units and a special high quality crossover. 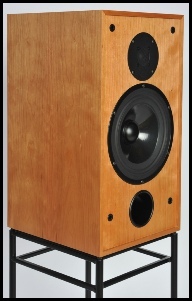 The SB-88 cabinets use the same thin wall 9mm birch plywood as used in our acclaimed LS3/6 and LS3/5a V2 loudspeakers. Double thickness rubber pads dampen cabinet wall resonances and acoustic foam controls internal standing waves. The result is a low colouration yet dynamic and involving loudspeaker which exhibits excellent stereo imaging and a wonderful fluid vocal quality. Sitting perfectly between our LS3/5A V2 and the LS3/6, the SB-88 is ideal for applications where the LS3/6 is too large. It sounds extremely similar to the LS3/6, giving just little away to its larger brother in the bass and extreme high frequency areas. Although designed with the domestic user in mind, the SB-88 has also found favour with professionals. The new speaker ideally requires 480mm high stands and we can supply matching stands from Something Solid. Interested customers should contact Stirling Broadcast or Something Solid for further details. The SB-88 is sold with our standard 5 year warranty on the drive units and crossovers. “The SB-88, like other BBC-inspired designs I've heard, exhibits truth of timbre. They sound like musical instruments.” - Sam Tellig - Stereophile Feb 2014. “true transparency with no need to resort to the hackneyed treble-lift "trick" to give the false illusion of detail, combined with the sort of tonal neutrality that is very rare these days.” - Mark Hennessy. “What's special about the SB-88 is the timbre, the tonality: a character that seemed to be the same whether I used solid-state or tubes. The sound is sweet.” - Sam Tellig - Stereophile Feb 2014. The Product Brochure for the SB-88 can be found here and the Installation and Care Instructions can be found here. All brochures and instructions can be found here.